On the 28th of January we had a game using my "antiques" as Rob rightly said. Most of my English Civil War miniatures are three decades old. Game photos won't mean much to viewers I'm thinking but three below might prove appealing or at least diversionary for you. On Parliament's Extreme Left Flank we see Prince Rupert's Royalist Brigade of Horse. The Cavaliers are reorganizing and reloading pistols after having swept a weaker Parliamentary Brigade of Horse off the field. The nearest unit is Rupert's Regiment of Horse led by Rupert himself with his faithful dog, Boye. This is a newer unit from about seven years ago made up mostly of 28mm Redoubt Miniatures. Others are Hinchliffe. 1. Pike divisions typically deployed six ranks deep. So....almost eight years under the spell of Warhammer ECW's photos, I changed from 1:20 to 1:10. 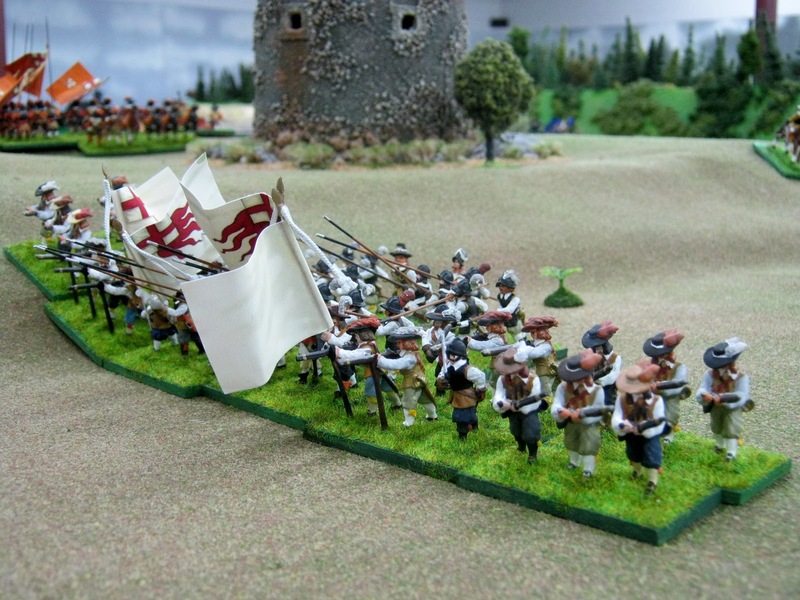 Most every regiment of foot was increased so it could have a minimum of twenty-four matchlocks and twenty-four pikes. Usually this meant adding eighteen miniatures. This was easy and fast to do although rebasing was needed. 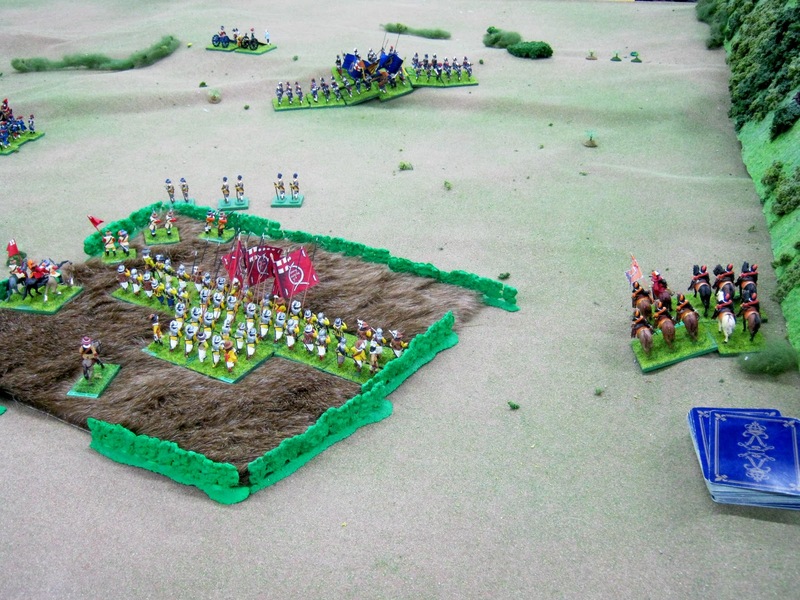 This allowed pike miniatures to be in four ranks instead of two. I did not want to do six. Moreover, I could have more than one flag using GMB's lovely products. 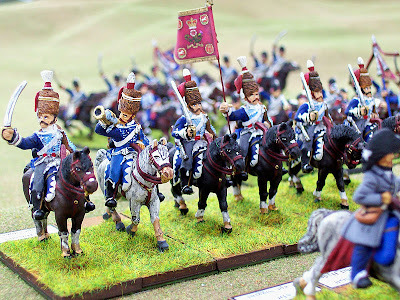 I thought Warhammer ECW's photos showing this kind of depth appealing and more correct for the era. 2. Colorful period isn't it? Lovely flags and every unit is a different color. 4. The collection has been sleeping for decades. I hope to get it on the tabletop several more times in 2012. In an idle moment last June I mentioned my very dormant interest in the Napoleonic "Peninsular" to Der Alte Fritz; Jim P. In a few more moments both of us rocketed into plans to build a small 1:10 force. We might even be on the same side for this one. Don Featherstone's writings about this era were initially responsible - never forgotten - but laying dormant for decades. 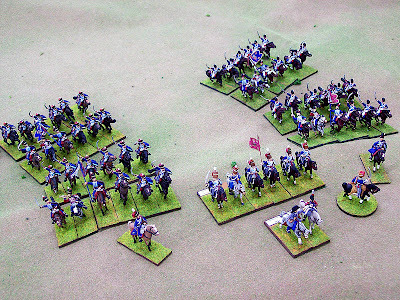 My initial contribution to raise a British Light Cavalry Brigade now completed -- follows. Two squadrons of 15th. 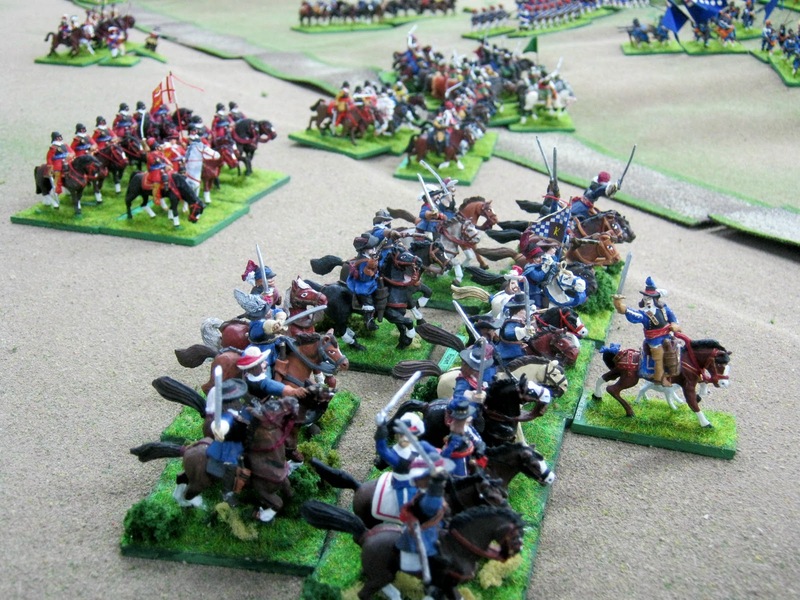 Hussars ride on the left whilst two squadrons of 16th Light Dragoons move forward on the right. Centered is one troop of 7th Hussars riding with Brigade Commander Lord Paget. 7th. 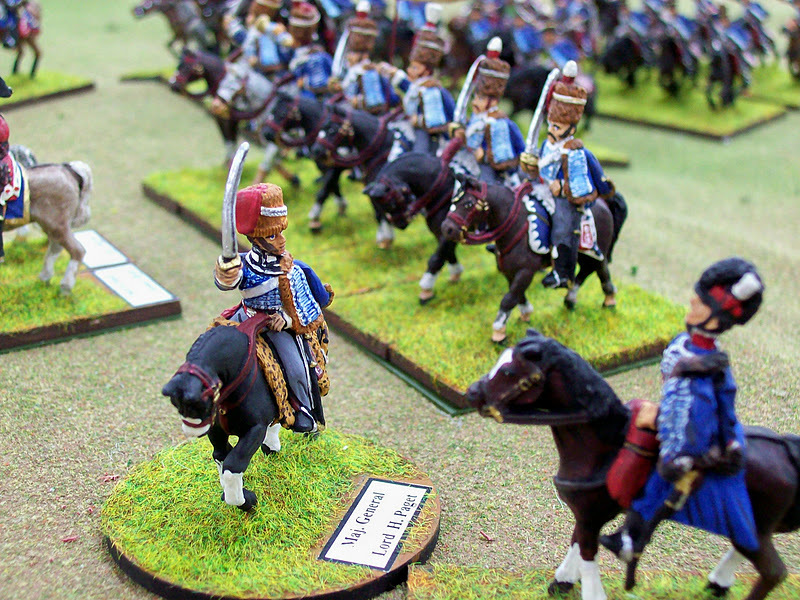 Hussars: 28mm Front Rank Miniatures with GMB standard. 15th. Hussars: 28mm Elite Miniatures with a GMB flag. Elites are a little taller and longer than Front Rank chaps. 16th. 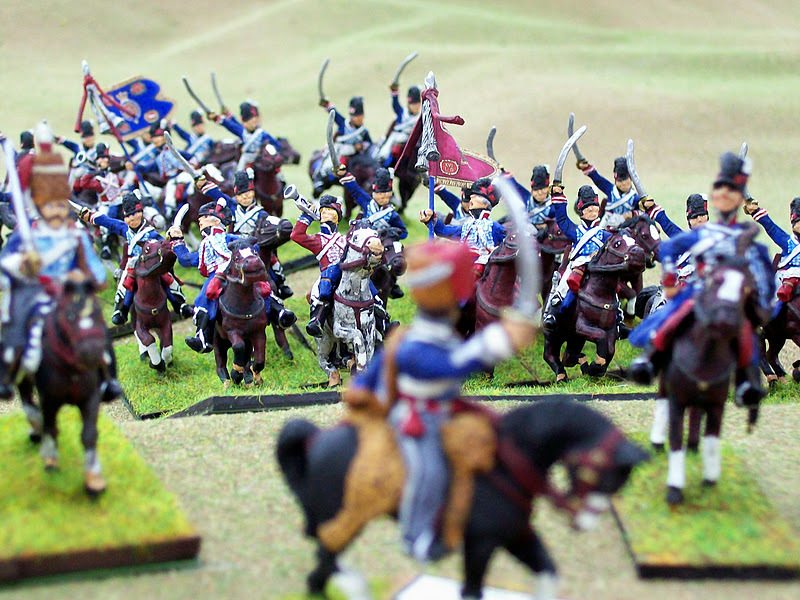 Light Dragoons: 28mm Elite Miniatures with a GMB flag. Lord Henry Paget confers with the regimental commander of the 16th Light Dragoons. 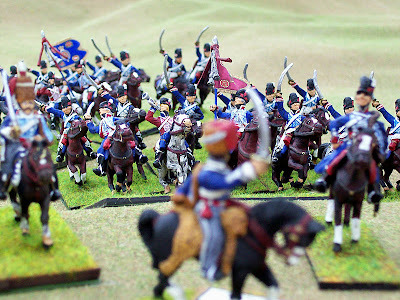 Paget [Front Rank Miniatures] was commander of the 7th. Hussars. He later became the Lord Uxbridge who lost a leg at Waterloo. He survived. 1. My next contribution is the 9th Foot. It was chosen solely because it was probably involved in more actions than any other infantry line unit. The plan is to finish the unit before May 1st. 2. 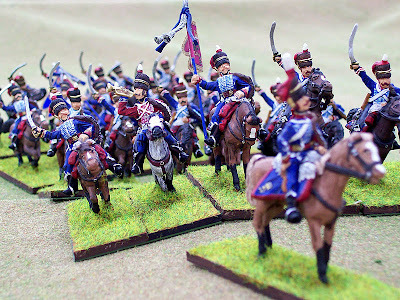 Jim is busily and happily involved with his Fife & Drum line of Revolutionary War miniatures and painting same for a debut at the annual Seven Years' War Assn. Weekend in late March. He hopes to get back to Spain soon. 3. Back to the Seven Years' War later this month or next!